How often is the demo for a game more expensive then the full version? And not just a little more expensive, about 10 times more expensive! The Twilight Princess Demo on Nintendo DS sold for $301. The full Twilight Princess game for Wii and Gamecube sell for about $30. Nintendo made a Nintendo DS demo trailer for Zelda Twilight Princess. They only gave it out at E3 to people at their press conference that year so there are probably fewer than 500 of these in existence. 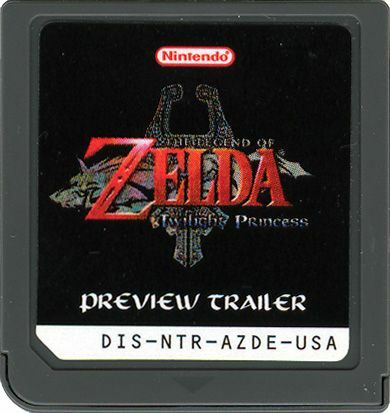 The demo cartridge just shows a short video trailer of the game, nothing playable at all. And as we said is common in our "Rare Games Come in Waves" article, another seller listed their copy on ebay. I'm guessing the price doesn't get quite as high this time. JJ - Hooked In Motion just released an iCollectVideoGames iPhone app - free with barcode scanning as an in app purchase (you get 10 free scans though). You get the idea :) There's quite a few work-arounds need doing, and from what I can tell the barcode scanner ain't recognizing restored entries (it should go "Oh look, you already have this game, here's the data you've already added". but it doesn't). I meant, add the IGN field in to the game cell, go to settings > Customise Game Cell > sdselect IGN Score. Meh dp... Oh and, the restore contains 275 PS1 games with UK median eBay UK sale values as of last week. Nowt else, yet. http://cgi.ebay.co.uk/ws/eBayISAPI.dll?ViewItem&item=290440093949 - One on ebay now. hello who are you? right comment like me?